The mission of Compassion Airlift is to provide free air transportation for eligible patients to medical facilities for specialized evaluation, diagnosis, treatment or rehabilitation not available near their home, especially for those who require a stretcher enroute. Transportation is available for patients who have both a financial need and a need for air travel, who do not require medical monitoring enroute, and who are unable to travel via public transportation. 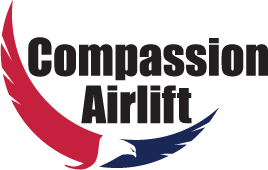 Compassion Airlift flights are also available for military veterans and their families, children going to special-needs camps, and others who have a financial need and a compelling air transportation need for humanitarian reasons. In addition, Compassion Airlift stands ready to help when called to satisfy disaster or emergency response requirements. Compassion Airlift is a 501(c)(3) non-profit, charitable organization based in Manassas, Virginia, that provides patient transport flights within the eastern United States. Transportation is provided in a stretcher-equipped, single-engine Beechcraft Bonanza flown by highly qualified and experienced volunteer pilots. Since 1977 Compassion Airlift (formerly flying under the Mercy Medical Airlift umbrella) has safely flown more than 1.5 million miles serving over 2,500 patients to or from every state east of the Mississippi River.